Indian cabbage curry recipe is a vegan and gluten-free. Made with onion and tomato in Andhra style. Best to be served for roti or for rice. This stir-fry recipe can also be made with potatoes and other veggies. This Indian cabbage curry recipe is one of the important classic dishes from my everyday collection. This is also the most reliable recipe to include cabbage in our menu. I need to confess that the cabbage is one of the least preferred vegetables for my guys at home. They don’t even touch in any form when it is served. So I always find different ways to serve this healthy vegetable. So I make cabbage in such a way that they cannot even notice that a particular dish is made with cabbage, like this cabbage Manchurian. cabbage chutney, or cabbage paratha. So that they don’t feel that they are eating real cabbage. This Indian cabbage curry is spicy and still have all the textures of cabbage. And this is the only recipe they agree to eat the cabbage as “real Cabbage”. And this is the story behind this delicious Indian cabbage curry. And it is made without any fancy ingredients while using just regular ingredients found in any Indian kitchen pantry. So, why are you waiting? make this curry and start including cabbage in your diet regularly. Medicalnewstoday also says that the cabbage helps for weight loss nutritious and everything. Cabbage is good for immunity and digestion. This is a good source for preventing cancer and constipation. What are the positive factors about Indian cabbage curry? Well, this is vegan, paleo and gluten-free. 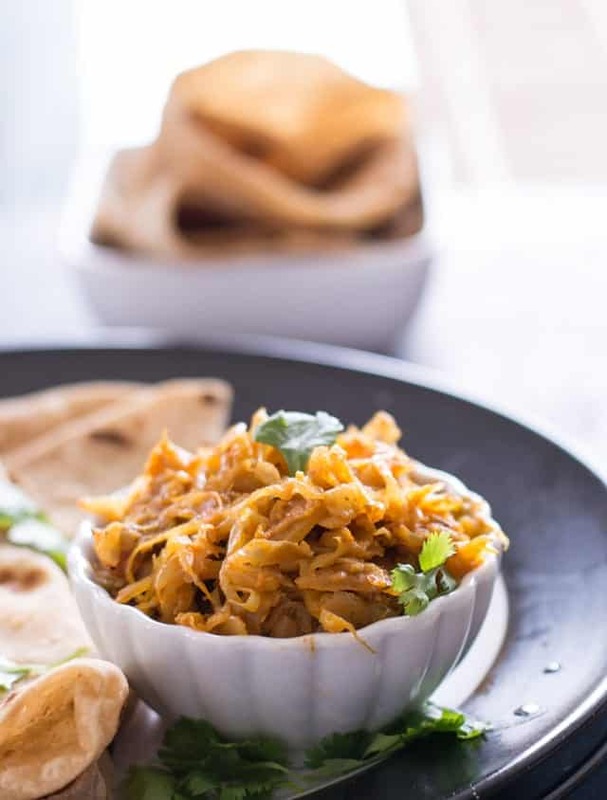 Homemade cabbage Curry is a super flavorful that you will want to make it at least once a week. You don’t need kitchen skills to make this, as this stir-fry recipe is easy to make. And I would grade this as a beginner level. This is a spicy dish, but you may reduce the spice level if you cannot hold up the heat. The curry tastes great when the vegetable is fresh. And the same way this curry taste good when it is made and served freshly. So I would suggest that you make it in a perfect quantity to serve for the family’s particular meal. And I would not suggest refrigerating the leftovers. As the curry may tend to lose the flavor and taste once it is reheated. You may use the mandolin to slice the Cabbage. This makes the preparations a lot quicker. Moreover, the shredded cabbage is more even and thin. This does also help the cabbage to cook evenly and faster. I have used Kasuri methi, another exclusive, unique ingredient of India at the end. Cooking in simmer flame with the lid would be the correct way of cooking this curry. But do not forget to stir occasionally. Use the non-stick or cast iron pan to make this stir-fry with less oil. If the cabbage starter sticks to the bottom then simmer the flame, add few drops of oil to cook Indian cabbage curry further. It is dried fenugreek leaves and has a very strong beautiful flavor. But You may skip this if it does not available to you. 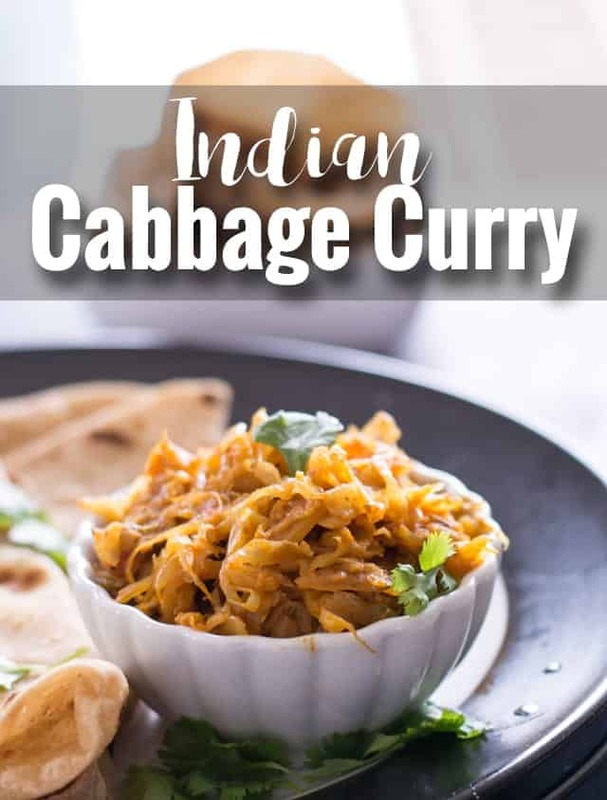 How to serve this Indian Cabbage curry? It is good to serve along with Roti or chapati. You may also serve raita or yogurt as a supplementary side dish. As this cabbage curry is a spicy dish and raita would just balance the spiciness of the curry. How long does it take to make cabbage Curry? Generally, it takes about 10 minutes for preparation and 20 minutes for cooking. 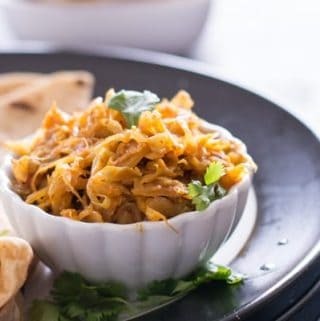 How to make cabbage curry with coconut? If you want to add coconut to Cabbage Curry you have three options. You can add a freshly grated coconut. Frozen coconut is available in nearby Indian/Asian stores. You may add ground coconut paste. To make ground coconut paste, you need to grind coconut with water in a blender. Finally, you may also add coconut milk. 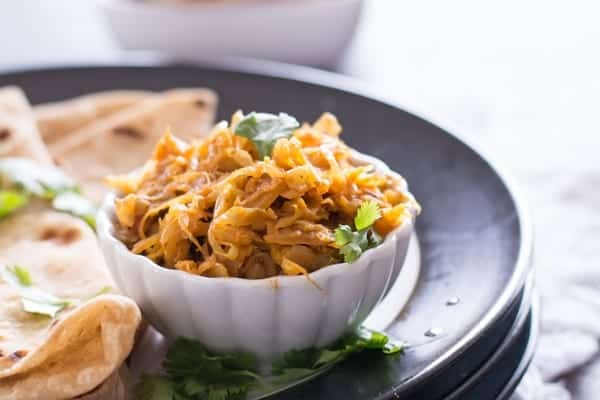 How to make Indian cabbage curry in a microwave? I have never tried making in the microwave, and I generally avoid using microwave after reading many articles online. But this post can help you to have the idea of making curry in a microwave. Can we make this curry with the potato? Yes, you can add potatoes int two ways. You may also add boiled potatoes in the final stages of cooking this Indian cabbage curry. What are the other vegetables I can add? You may also use green peas, chopped carrot, thinly sliced green beans, beetroot, cauliflower as a variation. Personally, I feel this is a great way to include vegetables in food. And this really does wonders for the kids who really hate Veggies. In a pan add cooking oil and cumin seeds. Allow cumin to splutter for a while. Then add chopped onion. And fry them until it turns translucent. Now add grated garlic and ginger. Saute until garlic becomes aromatic and changes its color slightly. Adding ginger and garlic is optional, this dish tastes delicious even without these additional ingredients. Then add chopped tomatoes. And saute until it becomes mushy. I want to tell you a small tip to make the tomato to cook evenly and faster. Add a quarter teaspoon of salt while cooking tomatoes. This process makes the tomatoes to cook not only faster but also to the great texture. Once the onion-tomato mixture shrinks down and becomes mushy, add a teaspoon of chili powder, 1/2 teaspoon of coriander powder and a quarter teaspoon of turmeric powder. Saute for a minute in simmer flame. Then added shredded cabbage and a quarter teaspoon of salt or as required. Simmer the flame, and cover it with a lid. Cook until the cabbage gets cooked completely by stirring it occasionally in between. If the cabbage starts sticking to the bottom add a teaspoon of cooking oil and stir. If you are diet conscious, you may also sprinkle little water while cooking. And please know that sprinkling water would slightly change the taste and texture of the curry. But it would be tasty too. Finally, add crushed Kasuri methi, and give a gentle stir. Serve this Indian cabbage curry with roti or chapathi along with a cup of raitha. Indian cabbage curry recipe is a vegan and gluten-free. Made with onion and tomato in Andhra style. Best to be served for rice or for chapathi. Keep a pan in medium flame, add cooking oil and cumin seeds. Allow cumin seeds to splutter. Add sliced onion and saute until it turns soft and pink. Add grated ginger, grated garlic and saute for a minute in low flame or until grated garlic slightly changes its color. Then add chopped tomatoes and continue to saute till it becomes mushy. Saute for a minute in simmer flame. Add shredded cabbage and stir well. Now add crushed Kasuri methi. And give a gentle stir. Remove from fire and transfer it to serving bowl. Serve cabbage curry along with chapathi or roti. Absolutely fantastic! We found this recipe to use for an Indian Pary. New Years we were hosting at our home. It was by far the biggest hit of our dinner and not a piece left at the end – everyone asked for the recipe. We now make this a couple times a month as a side dish for family dinners and double or triple the recipe so there are a good amount of leftover – as this tastes even more amazing the next day. Great alone or picked up and eaten in some fresh naan bread. Thanks Asha Jyothi for referring, Kasuri methi should be added at the final stages of cooking. I have added the information in the recipe as well. Thank you for your quick response…. Dish turned out very tasty…. We enjoyed heartfully!! !